Professor Hans Larsson has been appointed Director of the Redpath Museum for a five-year term that began on June 1. Larsson took over for Professor David M. Green, who has been at the helm of the Museum for the past decade. 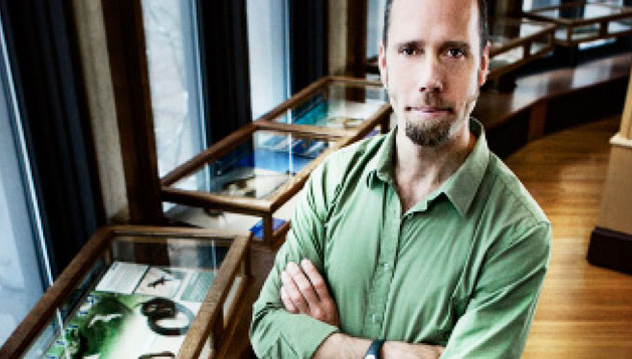 Hans Larsson, a specialist in Vertebrate Paleontology, is the new Director of the Redpath Museum. As announced yesterday, Professor Hans Larsson has been appointed Director of the Redpath Museum for a five-year term that began on June 1. Larsson took over for Professor David M. Green, who has been at the helm of the Museum for the past decade. Green will continue his active program of research and teaching in Herpetology and Conservation Biology at the Museum. A specialist in Vertebrate Paleontology, Larsson has been a member of the Museum’s faculty since 2003. He says he’s excited to take on the new challenges of integrating new appointees into academic life and furthering the Museum’s unique mission at the university.